From NYT bestselling authors Becky Albertalli (Simon vs. The Homo Sapiens Agenda) and Adam Silvera (They Both Die At The End) comes a long-awaited collaboration about two very different boys who can't decide if the universe is pushing them together or pulling them apart. Meet Arthur and Ben. ARTHUR is only in New York for the summer, but if Broadway has taught him anything, it's that the universe can deliver a showstopping romance when you least expect it. BEN thinks the universe needs to mind its business. If the universe had his back, he wouldn't be carrying a box of his ex-boyfriend's things. But when the boys have a chance meeting at the post office, they leave wondering what exactly the universe does have in store for them. What if - in a city of eight million people - they can't find each other again?What if they do ... and then can't nail a first date even after three do-overs?What if Arthur tries too hard to make it work and Ben doesn't try hard enough?What if life really isn't like a Broadway play?But what if it is?WHAT IF IT'S US PRAISE FOR WHAT IF IT'S US: "Romantic, realistic and sweet, this perfectly captures New York, teenage love and life in that gray area when you're not quite an adult and not quite a child either" - Lauren James, author of The Loneliest Girl in the Universe PRAISE FOR ADAM SILVERA: 'History Is All You Left Me overflows with tenderness and heartache. There isn't a teenager alive who won't find their heart described perfectly on these pages.' Patrick Ness 'This book will make you cry, think, and then cry some more.' Nicola Yoon 'Bold and haunting.' Lauren Oliver on They Both Die At The End 'A phenomenal talent.' 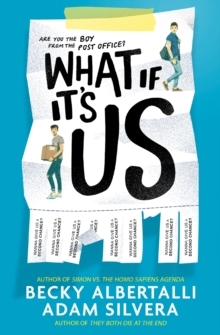 Juno Dawson PRAISE FOR BECKY ALBERTALLI: 'The love child of John Green and Rainbow Rowell.' Teen Vogue Praise for Simon vs. the Homo Sapiens Agenda: 'I love you, Simon. I love you! And I love this fresh, funny, live-out-loud book.' Jennifer Niven 'A wonderfully charismatic story about coming-of-age and coming out'.